← Blu-ray Giveaway: “The Grinch”! Story: David Dunn. Kevin Wendell Crumb. Elijah Price. All three are said to have super-human abilities. But do they? Dr. Ellie Staple aims to cure them of their suspected delusions once the three are safely ensconced in a Supermax research hospital. I’m sure that’ll go just fine. 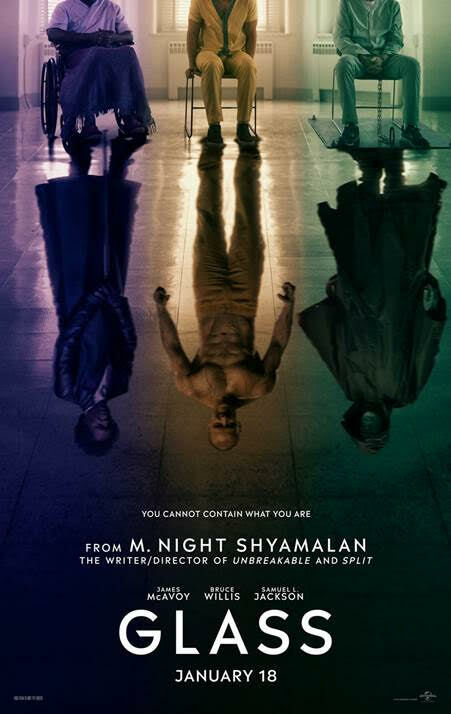 Remake, Sequel, Based-On, or Original: Part three of M. Night Shyamalan’s Unbreakable (aka “Eastrail 177”) trilogy. Gotta say: How in the name of Robert Bloch am I gonna write up a review for Glass without dropping any secrets? Wish me luck y’all. Because while it’s one thing to write up something I really love (or really hate) without tea spilling, a movie that I like, but have some problems with? Hmm…here goes. While each film in this trilogy has a slightly different vibe – meditative think piece, violent gore-fest and tightly wound standoff respectively – these films also share the same gritty philosophical world. A world that gets wrapped up in Glass, at least insofar as M. Night has generally planned. Yet in this film there are hints at a much wider universe, one that could possibly fold in many other pieces of his oeuvre, perhaps? Maybe I’m thinking too hard. Glass if a film that definitely wants you to think about things. What does it mean to be human? To be special? What is real, and what is fantasy? If you just had the opening strains of Queen’s “Bohemian Rhapsody” fire off in your head, that wouldn’t be too far from how this film spins around all of its themes and Deep Messages. There’s a lot to unpack here, and in the interest of not spoiling things, I’m not even gonna touch the lock. Instead, let’s talk about performances, shall we? Holy crap James McAvoy is breathtaking in the role of Kevin/et al. What started out as a fun but moving performance in Split becomes ferocious and completely lived-in here. McAvoy’s ability to switch between personas at the literal flick of a switch left me wide-eyed as I eagerly watched every second he was on screen. Samuel L. Jackson is, of course, a badass. But I don’t think I’ll be spoiling too much when I say that his Elijah isn’t his usual self for much of the film. But damn if Jackson doesn’t nail the Cuckoo’s Nest-like experience his character goes through. And as for Bruce Willis’ David, the dour superhero is as he was in Unbreakable, but gets a few sardonic quips in. There’s even David’s son Joseph,who’s played by Spencer Treat Clark, the same actor from the original film. There’s a nice familial chemistry between the two, which makes the climax of the film…oops. Speaking of callbacks, Elijah’s mother (Charlayne Woodard) is back from Unbreakable, as is Anya Taylor-Joy’s Casey Cooke from Split. As the three main characters cool their heels in the hospital, Sarah Paulson’s Dr. Staple coolly assesses their psyche. Paulson gets to flex her considerable chops here, and her fans won’t be disappointed. Dr. Staple is just as layered as any character in AHS, and Paulson gives it her all. So what’s the problem? Well, as much as I appreciate the story, and how things get unfold in the final third of the film, there’s something missing. It’s as if M. Night had a fantastic idea, put almost all of that idea into this film, but left enough gaps in things to give a disjointed, generic overall feeling to the film. It’s not so much paint-by-numbers as it is “oh, okay so that’s what it is – cool I guess”. That’s not bad, but it’s not the incredible finale a trilogy fifteen years in the making should end on. These characters deserved a bit more…jazz hands? Pomp? No, that’s not it. Depth was what’s needed. The plot could have used more intensity, especially given the comic-book stylings of the trilogy itself. Perhaps shoe-horning in so many vivid characters could only end up leaving a lot of the energy missing. Or perhaps it’s just that putting together characters from films that were character driven into a film that’s plot driven needed more focus on the characters themselves rather than their predicaments. It’d have been an easy fix; at just over two hours, more of that time could have been used diving into character motivations and arcs, rather than drawing out settings, transitions, and the ever-present and still wholly unnecessary M. Night bit part. Still, even with the messy story, there’s no doubt that Glass delivers an affecting third act that actually had me wanting a bit more. What? I can be contrary. To be more than that would require spoilers, and I won’t do that to you. Today. All in all, Glass gives moviegoers who care to think a lot to think about. It was wonderful turning those ideas over in my own head. I’m betting you’ll feel the same. Grade: B-? C+? I’m still not sure yet. So how about we go with C++? #Protip: Want to get Beast-mode jacked? Well, if you’ve got the willpower (I don’t), in an interview with GQ Magazine, Magnus Lygdback – the man McAvoy went to to get buff – shares some pointers. This entry was posted in 7 Pieces Of, Movie Reviews and tagged M. Night Shyamalan, Movie Reviews, Trilogies. Bookmark the permalink. Having not seen the first two movies in the trilogy, I didn’t know if I would get it…but amazingly the backstories weren’t really necessary (at least to me) since M. did a good job, imho, tying them in throughout. I really enjoyed this movie, but I can see where one who’d watched the first two could be disappointed. Overall for me would be a solid B+…some of those institution scenes could’ve been shorter.